As I promised, my “Great Eats in Bangkok” series is in fact becomming a series and not just a single video. Using my new wireless microphone that plugs into a Kodak Zi8, the audio quality is a bit better than the first time I shot the footage for this episode. I’ll have to keep playing around with the equipment in order to learn to master it, but hopefully each successive volume of the series will get better. In this volume we explore one of my favorite Thai desserts, something called khanom krug. “Khanom” is the broad term used for snacks and nibbly type of desserts and “krug” refers to the half-sphere shape in which these tasty treats are made. You can loosely describe khanom krug as “rice flour and coconut milk pancakes”, although that description fails to capture what makes them so special and worth seeking out. The interesting thing about khanom krug is how it is composed of two batters, both made with rice flour and coconut milk. One batter is a little saltier and the other is a little sweeter. The sweet batter is poured into the indentations in the pan, filling them about 2/3 of the way. Then a few seconds later the saltier batter is added. 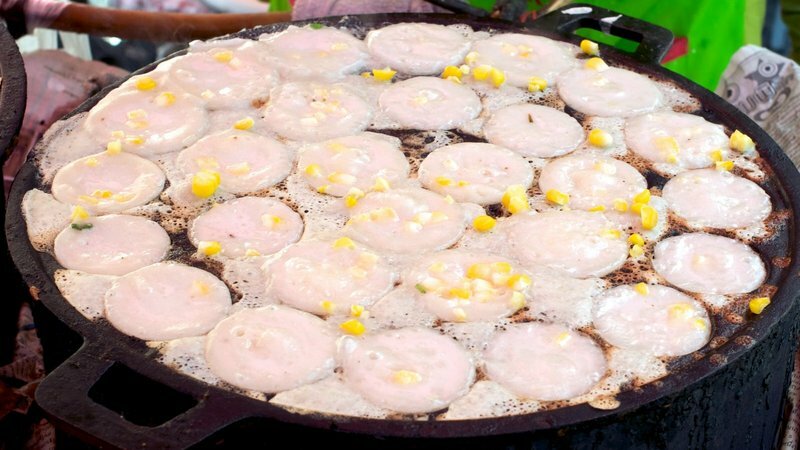 Savory fillings such as corn, taro, or free onions can be added (but just as often, are not) and then the whole thing is covered and allowed to bake and steam for several minutes. Once the khanom are fairly firm, but still a little molten in the middle, the halves are scooped out and paired together for serving. You have to be careful of a few things when eating them: first, they will be incredibly hot and the interior will decimate your tastebuds like lava flowing through a forest. Second, don’t let the vendor put the container of them in a bag. 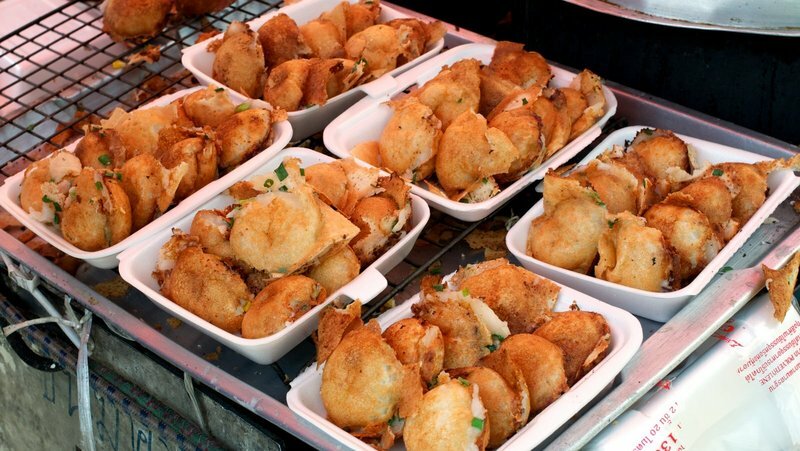 Steam is the enemy of these khanom and they will lose their crisp exterior very quickly. Third, solve that problem by eating them right away! I hope you enjoyed the video. A third one is being edited now and the first volume, focusing on rice noodles called guaytiaw, is here. This entry was posted in Uncategorized and tagged Bangkok, Coconut, Eats, Flour, food, Great, khanom, Khrug, Krung, Krungthep, Market, Milk, rice, snack, Stall, street, Thailand, travel, vendor by christao408. Bookmark the permalink. Wow, it all looks sooooooo yummmyyyy!!!! Do they also eat insects there like in China? That looks very interesting – the contrast in taste and texture sounds amazing. The mic is working nicely. I can hear the batter sizzling as it hits the hot pan. Do a lot of folks stare at you while you folks are filming? OK I’m going to have to try those… you know I’m making a list! hehe! You should be on the Food Channel haha. I would watch! Oh very delicious, that’ll be on the itinerary, right? Looking at your video, I can “smell” the coconut and egg batter.By the way, nice production, looking forward to more “Great Eats”! sounds delicious! i can imagine them being very hard to eat, but definitely worth the risk of burning your tongue! great video!! very professional. totally Travel/Food Network caliber. i want some now! You need a gig on either The Travel Channel or The Food Channel. Nice job!!! @christao408 – I bet they were all swooning when they heard your voice. I have something like this too here and use it to make pancakes sometimes. But often times after I add the first layer of rice flour and the coconut milk, I add shredded coconut with sugat in the center and then top this off with a second layer. That also tastes very good. The video is great Chris. @yang1815 – Thanks for letting me borrow your pictures Andy! @crazysogul – Swing on by Bangkok or if there’s Thai Buddhist Temple in your area, they often have community markets on Sunday mornings where members prepare and sell Thai food as a fundraised. The one in Berkeley, CA has a lady who makes some amazing khanom krug. I’m sure other locations do, too. Thanks for your comment. @PunkRockCowboy – Ha ha! My plan succeeded. Thanks for stopping by and commenting. @ZSA_MD – Oh, Zakiah, that would be a perfect addition. Maybe I should bring some shredded coconut there and ask her to make a custom batch for me! @christao408 – Not a problem at all! @nhocrua – Yup, it is not a bad combination, is it? Thanks for your comment. @Applebook – I say that you should stop putting spam on my blog, thank you.